Bright spring sunshine, teeming summer seaside fun, autumn colours and winter landscapes The Oslofjord changes with the seasons And our sightseeing tours offer you daily departures from Oslo all year round! Departures from Rådhusbrygge 2, Oslo (the pier just below Oslo City Hall). 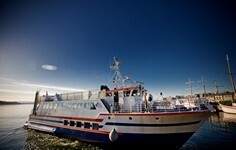 Visit Sightseeing Tours Oslofjord for more information. Tickets are available at the Tourist Information Centre by the Oslo City Hall, at Trafikanten (The Traffic Tower) by Oslo Central Station and also at selected hotels. You can also buy your ticket on board our sightseeing boats, but to ensure your seat it may be wise to book in advance. Hovedøya, a protected nature reserve, with its unique fauna, where the Cistercian Monastery was founded in 1147. Lindøya, Gressholmen; known as "the isle of rabbits", originally Norway's first airport. Heggholmen; Inner Oslofjord's oldest lighthouse. With its ornate, elegant style the lighthouse stands out from other wooden lighthouses, Nesoddtangen, where you will see traditional, charming beach cottages lined up along the shore. We pass the narrow strait by Kavringen and Ildjernet. Steilene (The Bridles), known for its terrifying past; whose name reflects the instruments of torture used on prisoners on death row and so much more! Gåsøya, Langåra, Ostøya, Brønnøya, Nesøya, Borøya, Kjeholmen, Grimmsøya, Snarøya, Vassholmene, Bygdøy and even more! Arrival - Bygdøy museums: 10 minutes before arrival in Oslo harbour, the boat stops at Bygdøy, so those who wish to see more on their own can go ashore and visit the museums. This sightseeing tour will show you all the beautiful islands of the Inner Oslofjord as we sail out to the grand historic Oscarsborg Fortress. Oscarsborg Fortress stands on Kaholmene in the Drøbak Strait. The fortress has been there for more than 350 years, Oscarsborg is best known for the sinking of the German battleship "Bl�cher" on the 9th of April 1940. We sail past Askholmene where you may still get a whiff of the creosote (lignite tar) from the battleship. Slemmestad, Håøya, Søndre Langåra with its ancient bell tower. The mines at Spro. Granerudstøa, Svestad where the large tank walls from the oil plant "The Norwegian-English Mineral Oil Company" still stand. Nesodden's idyllic Fjellstrand; the delightful Paradisbukta (Paradise Bay) and more! � Prices do not include vat, or drinks.